"In the world of fishing, there are those that can cast, other’s that can fish and others who are great to spend time with. Seldom do these three come in one package like Chris Dore. Not only is Chris a great angler and caster but he’s a great guy with the patience and aptitude to improve any anglers skill and enjoyment level of this sport. 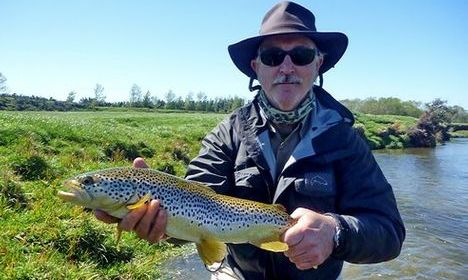 All I can say is; if you get the chance to join Chris on a days guiding or a casting clinic then don’t miss it; your view of fly fishing will never be the same." "When Chris had a last minute cancellation and was able to guide my brother and I on a spur-of-the-moment trip - I suspected we'd gotten lucky. "Chris Dore is a rare talent. Anyone who can handle my brother's 'hammer-n-collapse' cast and still get him stuck repeatedly into trophy-sized brown trout is nothing short of a miracle-worker. 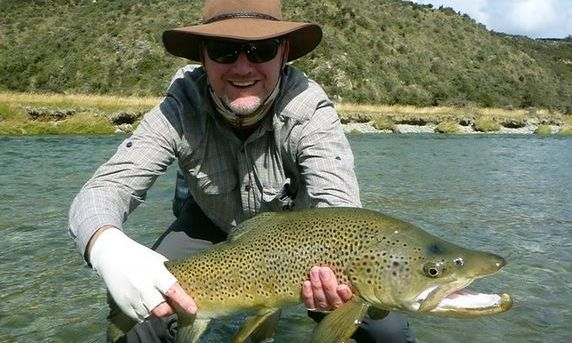 Chris, thanks for unflinchingly putting in the hard yards and showing a couple novices some amazing trophy trout fly fishing and stunning New Zealand scenery. Your optimism is both contagious and relentless - I'm convinced the fish had no choice but to materialize in response to your sheer willpower…and not just that - you MADE them eat as well! I truly hope we get to fish with you again. You are the gold standard, in my opinion. It's no surprise your season is booked before it even starts. P.S. Thanks for working the side-deal in advance to make sure I landed more and bigger fish than my "hack fisherman" older brother. There's nothing quite like fair competition to deal with sibling rivalry! " 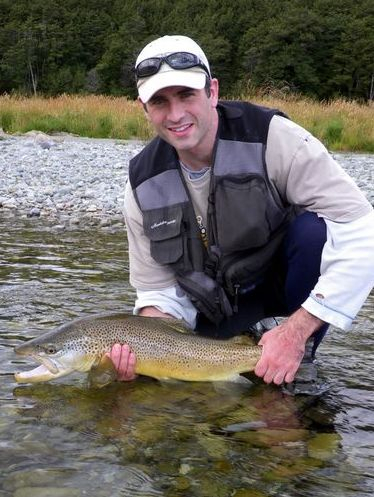 · Knowing that those fish will only get bigger until we get back next year - passport in hand! 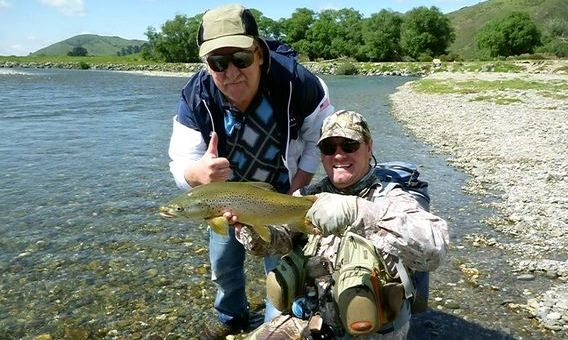 A massive thanks for facilitating a truly special fishing trip." "Am back from Queenstown and damn it's hard to get back into work. Had 4 full days down there, 3 fishing and one chasing bambi. The weather, like the scenery, was spectacular. First stop was some casting tuition from Chris Dore, an hour VERY well spent ironing out some of my 25 years of self-taught water whipping. Can't recommend Chris highly enough - superb knowledge and ability for accuracy and distance etc techniques, and a really natural ability to communicate. I've seen other 'experts' giving people lessons and it's been drama. Not so with Chris, I'd never met him before and felt like I was learning from a mate I'd known for years, blardy brilliant"
Two memorable days fishing with you on a couple of true Southern gems .With your on-going tips our casting improved out of sight, we can now laugh into the face of the wind. 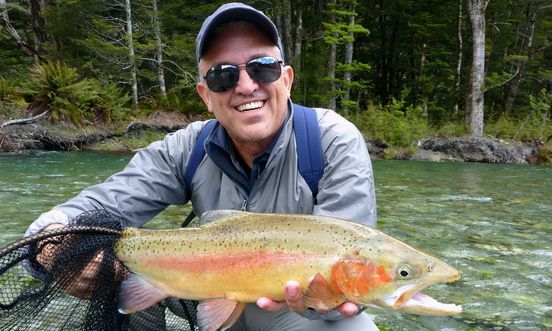 Your enthusiasm for all things fly fishing was infectious, and your extensive knowledge was an invaluable source of information to us as relative newcomers to fly fishing. Teaching Mark to Spey cast might prove costly though, as I might have to give it a go, another rod and reel !! Simply Chris, a five star guide." 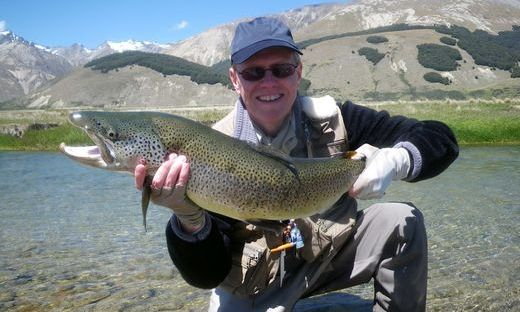 Well here I am back at home in the land of the pygmy trout after a month in NZ. This is just a short note to say thank you once again for a wonderful 2 days. I really enjoyed the time spent with you and the fishing.Your attention to detail and the easy way you guide your clients was wonderful to experience and I learned a lot. Those fish were dreams come true and I still visualize them and look at the photos too. Particularly that first brownie on a dry. May your business go from strength to strength! I’ll be back for more fishing in 2013!" "Wow, photos loaded onto my iphoto, video reviewed and I don't even look stupid somehow, amazing work on your part! Thanks for a wonderful day in the backcountry, for great fishing, for amazingly efficient instruction, for being patient and for showing me some very special country and water. It was so very nice to be out there and you could not have been better." I just wanted to take a moment to say thanks again for the wonderful day we spent with you in Backcountry Southland. 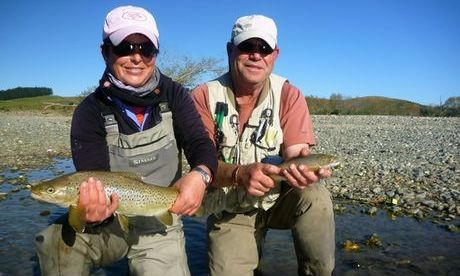 Our friends are simply awed by, what I am calling officially as, "the big trout" photo that my Chris caught with your help! Seriously, your help in catching this fish was awesome! It was such a fun day that I will remember for a long time......Also, can't help but say thanks for giving me some much needed assistance in "how to cast in the wind". Because of your excellent instruction, I was able to make some great casts the rest of the week when faced with gusting wind. I won't forget your instructions and am ready for whatever the wind sends my way! Thanks again Chris and we send many people to your web site to look at our photo--very fun!" camping & fishing, but this was obviously no longer on the cards. Time to invoke plan B.
home. Chris went hard, put in the yards and taught me plenty. I will return!" 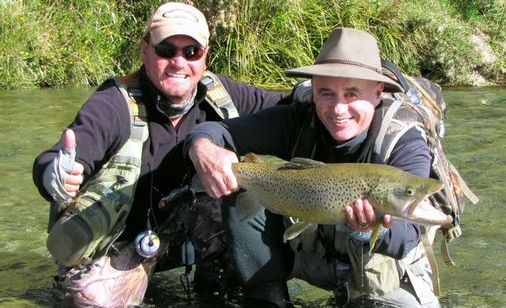 "My intention in going to NZ was to make some memories- so got a recommendation to use Chris Dore as a fishing guide. 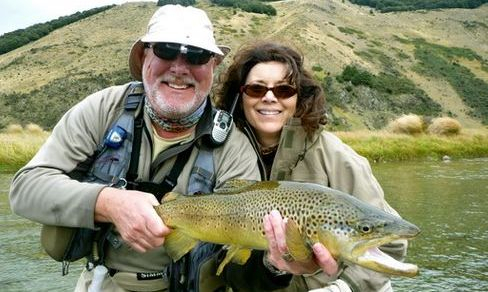 The two days fly fishing with Chris was most defiantly the highlight of my Kiwi experience. Being no expert fly caster I found Chris to be very knowledgeable on casting techniques as well as providing timely yet positive critique on how I could be more effective. I also like the fact that he is rigorous, constantly checking the line for nicks or wind knots- everyone (except for the trout) would be disappointed if the big one broke off due to a nick or wind knot in the line. 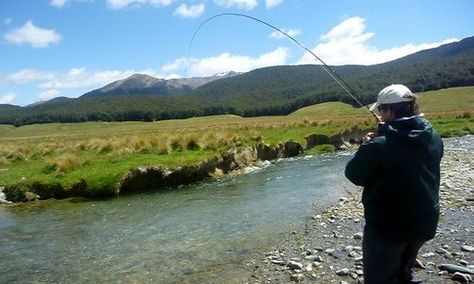 Chris was also very patient and positive- he would happily and efficiently tie on a new fly if a sighted fish would not respond to the current offering. I would estimate that he tied on over 50 flys during our two days of fishing. At one point we had a line on a large rainbow set in a difficult current. We went after that fish for the better part of 40 mins, constantly changing offerings and trying different drifts- I was ready to give up on this fish when Chris tells me he wants to try one more approach, something 'outside of the square'. That was the trick that got that lunker to bite. Very satisfying indeed. " “Watching this...carefully.........STRIKE!” - ahh music to my ears as I fly over the Tasman back to Melbourne! Your website says how you handle the excitement is up to you – but I wasn’t quite prepared for the build up of stalking, spotting and targeting 4-6 lb wild brownies in crystal clear waters. It was also incredibly rewarding learning new casting and presentation techniques. With you on our shoulder offering advice and words of encouragement, my dad & I never doubted we were always in with a chance. Thanks again for helping create such a memorable 2 days for my dad & I to talk about for years to come... that is unless we come back next year!" Thanks again for a terrific week. You're a great guy and everything a guide should be. One of the best! I came away feeling like I had learned a hell of a lot. Look forward to fishing with you yet again. "Thank you for a superb day out fishing plus! The photographs are superb, and I already have one on my desk top- guess which one! Shelley and I greatly appreciate your professional and personable guidance through the day. enthusiastically to your wife's idea of a chair, a bottle of wine and a good book by the river! The only concern is that I will have to carry her out! I catch a 4 lb wild brown trout! giving you time to recover from dealing with the Auckland novice!" I wanted to thank you again for a couple of great days fishing. I learned a tremendous amount, and had a great time. 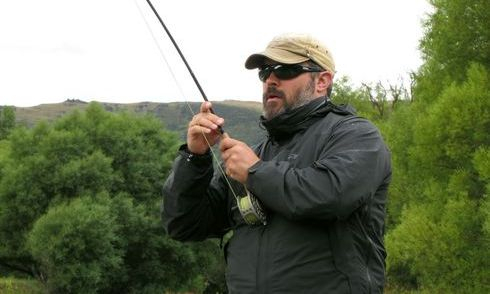 I've fished with guides through much of the western states here in the USA. You are as gifted a guide as any I've fished with. You've got all the info on the rivers, fish, and surrounding areas, which made our days educational and entertaining. Your casting instruction sure came in handy when the wind kicked up on Saturday. Beyond the usual, the thing that impressed me most was your ability to spot the fish in the water. I've been fishing for most of my life, and I would have missed most of the fish you saw. There is no question your eyes and instincts put us on to more fish than I would have gone after in two weeks of fishing alone. Thank you. I'll be back, will be in touch, and look forward to going after the ones I missed. All the best in 2010"
Hey Chris. I wanted to thank you again for four awesome days of fishing. 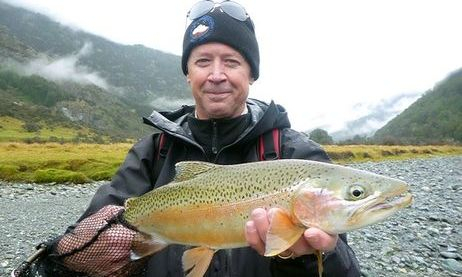 You are truly a fishing guide extraordinaire – great fish sighting skills, the frequent fly changes and tippet checks, all of the patient coaching, a great photographer, and just your unwavering enthusiasm. The day on that special river I’ll remember for a long time – I cant believe I caught so many fish of that size! Great Stuff!" 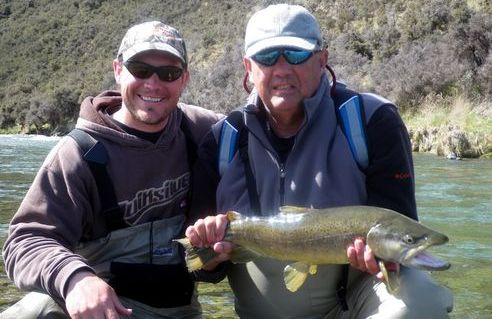 "Chris is by far the best guide I have ever fished with. He is extremely knowledgeable, personable, very patient and modest. Chris got me into some great fish, but more importantly he taught me more about tactics and techniques for trout fishing in two days, than I had learned on my own in several years. 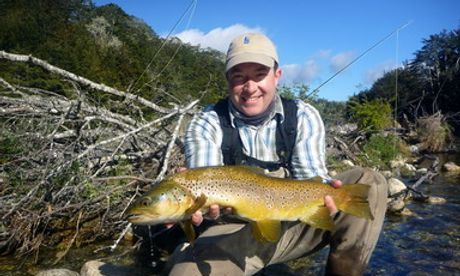 If you're looking for a top quality experience with a fantastic guide fishing the South Island, Chris is the right choice without a doubt." "Given that I only had one day to spend on the water, I wasn't sure what our chances were of sighting and landing some nice fish - I can only say that with Chris' guidance, that single day became one that I will never forget. Chris is an incredibly knowledgeable and capable guide. He put us on some fantastic fish immediately and throughout the day. Chris was able to give me some valuable casting tips to improve my abilities. Beyond the fishing talk, Chris was a great source of local knowledge and was able to point us to some great pubs and restaurants in town. His encouragement, patience and genuine enthusiasm kept me motivated to keep working for some pretty tough fish - which paid off in the end!" So you get the message... For further references simply google me, or go in and ask about me at your local fishing club or fly shop - chances are they know of me. I look forward to talking with you soon. Chris Dore.